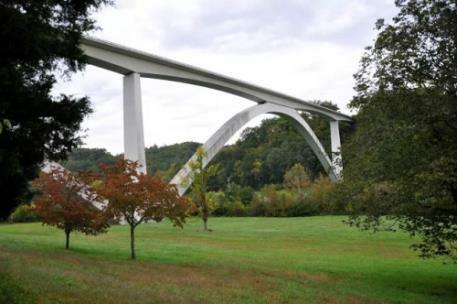 The Natchez Trace Parkway Bridge, a concrete double-arch bridge outside Franklin, famous for its architecture and sweeping views, has gained a reputation in recent years for its use in suicides. Answering a request from Trish Morelo with the Natchez Trace Bridge Barrier Coalition, Jenny Retherford, senior lecturer in UT’s Department of Civil and Environmental Engineering, established a senior design project aimed at developing barriers on the bridge. 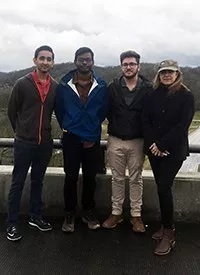 “Civil engineering, at its core, is all about serving for the betterment of humanity,” Ms.
Ms. Retherford’s team of students face a number of challenges due to the bridge’s location in a national park. Any change to the bridge must conform with park rules mandating design, materials, changes to aesthetics and even the feeling it evokes when viewed. The students are spending the spring semester tackling the project. Tennessee State Representative Sam Whitson, whose district includes the bridge, introduced legislation aimed at loosening National Park Service rules so the bridge could be altered. That legislation passed through the Tennessee House of Representatives on March 14 and is now headed to the state Senate. In addition to Ms. Abdo, the team includes students with concentrations in structures, construction management, transportation and water resources. The students have recruited a team of mentors from the Federal Highway Administration and the Tennessee Department of Transportation who will provide guidance as they move into the technical engineering work. Ms. Morelo was led to create the Natchez Trace Bridge Barrier Coalition after her son John died at the bridge in January 2016. The people he left behind had seen few warning signs: he was a good student, didn’t miss school and had landed a scholarship to the University of Alabama. Ms. Morelo learned about the other instances at the bridge, and that the bridge’s design played a role in its grim reputation. “Barriers are the only way to prevent people from jumping from bridges,” Ms. Morelo said.